Pardon the name-drop, but a little more than three years ago, through a lucky set of circumstances, I met Thomas Fontaine, the Jean Patou house perfumer.1 For me, it was an amazing afternoon of seeing what a real perfumer’s lab looks like, tasting jasmine and rose Pierre Hermé macarons, and talking fragrance with someone who lives and breathes a world I’ve mostly only read about. One thing in particular sticks in my memory. Talking about Joy, Fontaine mentioned walking past women — mostly older women — in the street and inhaling their lush, complex sillage, “like a fur.” He described this style of fragrance as “old fashioned.” I bet Fontaine would say the same thing about Moment Suprême. Moment Suprême is a spicy ambered harmony; its first soft sensual warmth is due to lavender, geranium, cloves and bergamot. Its rose-jasmine heart lends elegance and refinement before its final blossoming from the ambered base which reinforces and draws out its very uniqueness. Since Alméras created some of the first Les Parfums de Rosine, Poiret’s perfume line, this clinched it. One more potential bone of contention: the Ma Collection booklet establishes Moment Suprême’s birth as 1929, but Jean Patou: A Fashionable Life places it at 1931. But enough background. Let’s get down to the fragrance itself. I’m basing this review on decants of two Moment Suprêmes: a pre-Ma Collection Extrait and the Ma Collection Eau de Toilette. If vintage Dana Ambush is Miss Moneypenny, Moment Suprême is James Bond’s slightly older lover from an aristocratic family. She never could conform to her family’s expectations, yet neither could she give up the first-growth Bordeaux and sables that came with her name. Besides dallying with Bond, she just might make a pass at Miss Moneypenny. Moment Suprême, especially in Extrait, is a fat armload of lush flowers with a crisp lavender-geranium veil. Besides rose and jasmine, I wouldn’t count out powdery mimosa, iris, clove-like carnation, and a juicy gardenia, too. It’s a whopper of a bouquet, richocheting between an intoxicating freshness and an almost opaque, past-its-due-date tangle. To me, it smells best caught by accident rather than studied with my nose pressed to my arm. The whole fragrance shines through the sepia tones of amber and musk. Sometimes I smell something a little dirty and animalic, but, as in Joy, it might well be the jasmine. The fragrance is big with parts and moves surely, but without a ballerina’s grace. But, frankly, I don’t want a ballerina here. I want the whole ballet corps after a few drinks. You won’t be surprised to learn that the Extrait is bigger, more angular, and more layered. Still, the newer Eau de Toilette is a smoother, creditable version. Moment Suprême in both Extrait and Eau de Toilette lasts about three hours before shrinking to a longlasting but less compelling amber-musk hum. No, Moment Suprême isn’t fashionable. Like, say, Wagner, it’s complicated, mannered, and requires too much attention for the less dedicated to fully appreciate. It will never make a guest appearance on Housewives of Las Vegas or in the pages of Cosmo. It’s an anachronism, just as old fashioned as Thomas Fontaine called Joy. I love it all the same, if not more, for it. 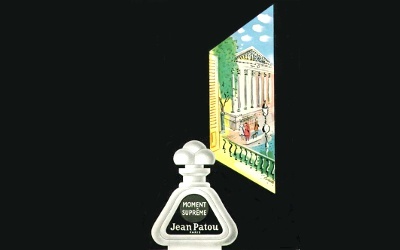 Jean Patou Moment Suprême is discontinued and costs a fortune online, especially the pre-Ma Collection versions. Cross your fingers that Patou brings it back as part of the Heritage Collection. 1. While I’m name dropping, allow me to mention that my sister used to babysit Merle Haggard’s grandkids. Also, I once met two of the current Von Trapp family singers at a party. 2. page 119. Polle, Emmanuelle. Jean Patou: A Fashionable Life (Flammarion S.A. Paris, 2013). Just keep your eyes out! Maybe one of the EdTs from the Ma Collection set will turn up at an antiques mall. I’ve seen them before…. Among my very favorites, as you know. I don’t think of myself as a Wagner, maximalist type of gal, but you’re certainly right about the style of it – it is a big-bosomed, “High and Mighty Princess” aria type of scent. I love, of course, the lavender and geranium, but also the whisky-cola heart. It’s a good one! Not fashionable, but loaded with style. And I love “whisky-cola heart” as a descriptor. Always so great to hear about gems from the past. You must have the best luck in the universe to be able to find those things! I once found an old Avon bottle with what might have been Sweet Honesty in it. That’s it. As for name dropping…. many, many years ago a very inebriated Yves Saint Laurent came out of a hotel in Nice and fell on me. And you didn’t mind of course! Adding new meaning to the phrase, “People I have run into!” LOL. The Extrait was a decant from a super generous friend’s bottle–super SUPER generous friend. And I love your YSL story! You didn’t happen to notice his fragrance, did you? Oh man, drunk YSL. Nice, France. Fell on you. Best. Story. Ever. I like 1000, too. That’s one I’d love to smell in Extrait. I bet it’s wonderful. I’ve just about depleted my brushes with celebrity! Once I passed John DeLorean on the street in Manhattan. Does that count? I’ve only witnessed 2 Dutch celebrities once from a distance, so you are really still streets ahead of me! I think some people have a knack for weird celebrity encounters. My dad used to be good at it and I think it was because, with the exception of sports figures, he was the least pop culturally aware person you ever met. He once accidentally became friends with Richard Dean Anderson and he was always doing things like meeting Metallica in the elevator or loaning his coat to Patricia Clarkson. We’d inevitably have to explain who these people were to him and he could never see what the fuss was about. There must be some sort of Murphy’s Law about that sort of thing. A wonderful review – so enjoyable to read and re-read. I especially like your remark about the perfume smelling best caught by accident. After all, that is how other people are going to smell the perfumes we wear and the element of mystery and surprise is what makes perfume great. But so, how would one wear Moment Supreme today? Teamed up with the simplest possible outfit, to let the perfume do the talking? I think Moment Supreme would be a good winter perfume. It would be just as lush as fur and cashmere, but would cut through them, too. That said, I don’t swan around in fur. Maybe with plush sweaters in mocha brown and purple? I like your idea, too, of dressing simply and letting the perfume take center stage. There should be a rule about not reviewing discontinued gems..
Great write up, thank you! I know! It hurts me just as much as it hurts you. I’m so glad you reminded me of this, Angela! I’m finding that an early spring day like today is the perfect time to appreciate it. That deftly balanced contrast between the rich florals and the fresh lavender and geranium. I must confess to several different bottles from my misspent perfumista-youth on ebay. I’m going to disagree with you slightly on one point. While they were, indeed, less expensive seven or eight years ago, Moment Supreme is one that can still be found at reasonable prices if you are patient. There must have been a ton of it sold. Not to mention the ridiculous prices being charged currently for perfumes that rely primarily on Iso E Super, etc., and are totally lacking in depth, complexity, and character. You know I would NEVER bring that up. Your review has inspired me to make this a Moment Supreme week! And I’m glad to know it’s possible to find Moment Supreme out there if we’re patient. Your post has fascinating history on Moment Supreme, Angela – thanks for your insightful detective work. I’m thinking perhaps those who don’t want to take a chance on vintage might consider trying the Maria Candida Gentile line. Thanks for the recommendation! That’s a line I haven’t spent much time with, but I’ve heard good things about it. BTW, there’s a 3 parfum cologne in the original box on ebay now for $110 (no affiliation). I have one just like it, and it’s lovely. Of course, there’s no guarantee of how a vintage perfume has been stored, etc. A gamble–but if it paid off it would be a score! My big lavender love right now is still Ciro Danger–lots of cinnamon and Rose, but lavender, too. That one is really beautiful, Angela! Another review I was grateful for. I’m hooked on it! I love its film noir feel. Maybe as the weather warms up a bit I’ll put it aside. Pierre Hermé!!! They also have very good ice cream. Its not always on display though, just ask for it. Too bad they do not have a shop in the Netherlands. Then again, if there was one, I probably would not have a waistline anymore…??? ?